Health and safety legislation places duties on employers for the health and safety of their employees and anyone else on the premises. In schools this includes responsibility for the head teacher and teachers, support staff, pupils and visitors (including contractors). The Learning in Harmony Trust (LiHT) is responsible, under the Health and Safety at Work Act 1974 (H&S), for ensuring each trust member academy follows this health and safety (First Aid & Intimate Care) policy and procedure. Part One of this document sets out the trust’s Policy with regards to First Aid and Intimate Care and Part Two sets out the procedures for situations requiring First Aid and Intimate Care. intimate care policy and procedures. Who is governed by this policy? All Learning in Harmony Trust Schools and nurseries. Appointed person: someone who takes charge when someone is injured or becomes ill, looks after the first aid equipment and ensures that an ambulance or other medical professional help is summoned when required. Appointed persons are not first aiders. They should not give first aid treatment for which they have not been trained. However, it is good practice to ensure that appointed persons have emergency first aid training/refresher training, as appropriate. First aider: A qualified person who gives immediate help to casualties with common injuries or illnesses and those arising from specific hazards at school; when necessary, ensure that an ambulance or other professional medical help is called. Paediatric first aider: A person who administers emergency treatment to any injured or sick children before professional medical care is available and who has a current paediatric first aid (PFA) certificate. 1.1 The Health and Safety (First Aid) Regulations 1981 set out what employers have to do with regards to providing adequate and appropriate equipment, facilities and qualified first aid personnel. 1.2 The Regulations do not oblige employers to provide first aid for anyone other than their own staff, but employers do have health and safety responsibilities towards non-employees, in this case young people, contractors and others that visit schools. The Health and Safety Executive (HSE) recommends that organisations, such as schools, which provide a service for others should include them in their risk assessments and provide for them. 1.3 In the light of their legal responsibilities for those in their care, LiHT schools should consider carefully the likely risks to pupils and visitors, and make allowance for them when deciding on the numbers of first aid personnel above the minimum requirements stated in this policy. Each school site must have a minimum of three first aiders (First Aid at Work trained staff) and other suitably trained appointed persons.. The EYFS Framework requires that a minimum of one Paediatric trained First Aider on the premises at all times where pupils are on site, or on an EYFS educational visit. The first aid annual risk assessment will determine the numbers of first aiders, paediatric first aiders and appointed persons required for each school, during school hours, out of school hours and during holidays. Reference must also be made to the Lone Working Policy. • provision for pupils and others complies with other relevant legislation and guidance. • numbers of epi-pens, blue asthma pumps and defibrillators. 2.2 The LiHT requires that each Head Teacher must annually in June and submit to the Trust in July review the school’s first aid needs and ensure that as a minimum three members of staff that are first aid at work trained and that a minimum of one paediatric trained member of staff is on the premises, or on each EYFS educational visit. The risk assessment for each school should specify how many first aiders and other appropriately trained staff should be on the premises at all time including non-term time. Appendix 3 has explanatory notes and a practical guide on first aid needs assessment and a simple checklist to follow in respect of the required provision for school settings. 2.4 The LiHT must arrange adequate and appropriate training and guidance for staff who volunteer to be first aiders/appointed persons. The LiHT must ensure that a risk assessment is carried out to ensure that there is an adequate number of trained staff to meet the statutory requirements and assessed needs, allowing for staff on annual/sick leave or off-site. 3.1 The employer or the manager (usually the head teacher) must inform all staff (including those with reading and language difficulties) of the first-aid arrangements. 3.2 This should include the location of equipment, facilities and the names of qualified first-aid personnel, and the procedures for monitoring and reviewing the school's first-aid needs. 3.3 First Aid notices must be displayed in a prominent place, preferably at least one in each building if the school is on several sites. 3.4 Including this first-aid policy and information in the school staff induction programmes will help ensure that new staff and pupils are advised of the first-aid arrangements. It is good practice to include such information in a staff handbook. 4.5.1 The initial first aid qualification (FAW) is valid for 3 years. Prior to expiry, a revalidation of the qualification is required. (This can be undertaken up to three months prior to expiry). This entails a 2-day course, which again is renewable after 3 years. Annual refresher training is available and recommended, but not mandatory, but should be considered as part of the annual risk assessment. 5.1 Guidance issued by the former Department of Education and Employment (DfEE) states that paediatric training must be undertaken for Early Years Foundation Stage (up to and including Reception). 5.2 The Office for Standards in Education (OfSTED) have recommended to EYFS that having someone holding a paediatric first aid qualification is good practice for those establishments with pupils between 5 and 8 years old. The Statutory Framework document, Section 3 - The Welfare Requirements, Page 26, states that in terms of illnesses and injuries “At least one person who has a current paediatric first aid certificate must be on the premises at all times when children are present. There must be at least one person on outings who has a current paediatric first aid certificate.” All newly appointed staff in Early Years must hold a Paediatric First Aid certificate. In addition to the First Aid at Work and Paediatric training courses, schools have the option to provide Emergency First Aid at Work Training. This one day course is aimed at lower risk activities and can be used as a supplement to the courses identified above. The individual school risk assessment will determine the numbers and levels of qualification required. 6.1 Schools should identify a member of staff to act as the ‘appointed person’ for first aid, with responsibility for taking charge when somebody is injured or ill. This person does not have to be first aid trained, providing they do not administer any form of treatment. However, good practise recommends that they receive emergency first aid training/refresher training as appropriate. An ‘appointed person’ is a person who has attended a one day course for the basic aspects of dealing with emergencies, handling ‘life threatening’ situations as well as recognising and responding to some of the more common ailments that may be encountered in the workplace. Appointed persons are not first aiders. They should not give first aid treatment for which they have not been trained. However, it is good practice to ensure that appointed persons have emergency first aid training/refresher training, as appropriate. These courses do not require HSE approval. • ensures that an ambulance or other professional medical help is summoned when appropriate. 7.1 Schools must record injuries, accidents or illnesses of pupils and staff when first aid has been given. Schools may use the record form (Appendix 1) or other suitable record sheet. • Description of injury sustained or illness and the first aid that was given (e.g. went, home returned to class, resumed duties or went to hospital (how) etc). • Name of person administering first aid or dealing with the incident/illness. 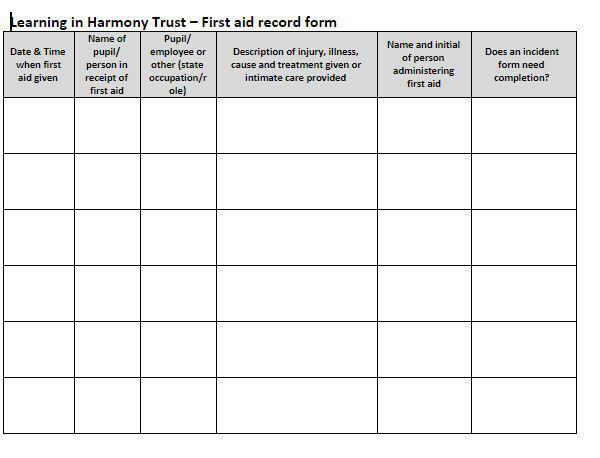 7.3 The form must record when first aid is given to staff/visitors/contractors. However, an incident form must be completed if they are injured/assaulted. Please refer to the LiHT Dealing with Incidents Procedure and report form for RIDDOR reporting requirements. 7.4 Schools must maintain a record of the names, qualifications and the expiry dates of all First Aiders – see example record sheet at Appendix 2. 7.5 The record forms must be retained in the school for a period of 10 years from the last entry date. 8.1 Schools and other educational settings can source first aid training wherever they choose, so long as the course provider meets the standards required by the educational setting and the Health and Safety Executive. Paediatric certificate training must always be the full certificate course. • 1 pair of disposable gloves. 9.2 The Trust expects all schools to consider as part of the risk assessment including epi-pens and blue asthma inhalers as part of the first aid provision. The Department of Health issued guidance, setting out how schools should safely keep and administer spare emergency inhalers and spare epi-pen injectors guidance. 11.0 Only suitable and qualified staff are permitted to administer medication. Please refer to the LiHT Medicines in School Policy. 11.1 LiHT Policy decision: Schools must purchase and hold in a secure location spare AAIs (Epipens) for emergency use in children who are at risk of anaphylaxis but their own device is not available or not working (e.g. because it is broken, or out-of-date). The number of epi-pens, dosage level and the storage locations of epi-pens will be defined through risk assessment, including contextual information relating to pupils needs. 11.2 The school’s spare AAI should only be used on pupils known to be at risk of anaphylaxis, for whom both medical authorisation and written parental consent for use of the spare AAI has been provided. 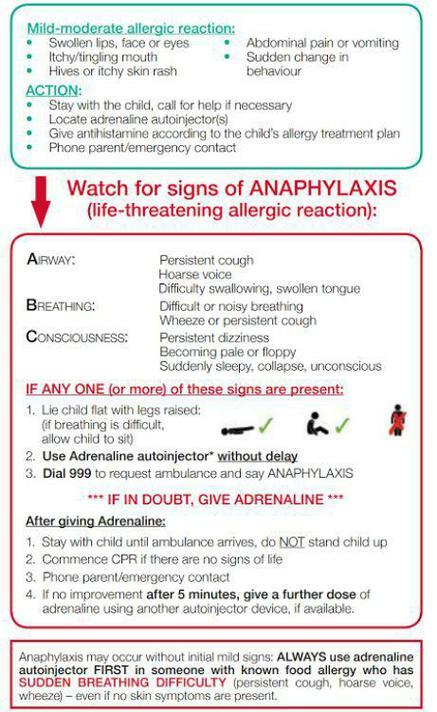 Schools must obtain consent for those pupils known to be at risk of anaphylaxis. The school’s spare AAI can be administered to a pupil whose own prescribed AAI cannot be administered correctly without delay. 11.3 Where an AAI has been used to support a pupil a records must be kept in the First Aid book and the parents must be informed as soon as possible that the medication has been administered. Any used Epipen must be disposed of in the school’s sharps bin, or given to the ambulance crew for disposal. 11.1 LiHT Policy decision: Schools must purchase and hold in a secure location spare emergency salbutamol inhalers for emergency use in children who are at risk of asthma attacks but their own device is not available or not working (e.g. because it is broken, or out-of-date). The number of inhalers and the locations of storage will be defined through risk assessment, including contextual information relating to pupils needs. 11.2 The school’s spare inhalers should only be used on pupils known to be at risk of asthma attacks, for whom both medical authorisation and written parental consent for use of the spare inhaler has been provided. Schools must obtain consent for those pupils known to be at risk of asthma. The school’s spare inhaler can be administered to a pupil whose own prescribed inhaler cannot be administered correctly without delay. 11.3 Where an inhaler has been used to support a pupil a records must be kept in the First Aid book and the parents must be informed as soon as possible that the medication has been administered. 12.1 In view of the vital role that AEDs can play in saving the lives of pupils, staff and other users of school premises, the Department for Education is encouraging all schools to consider purchasing these devices as part of their first-aid equipment. 12.2 The AED will analyse the individual’s heart rhythm and apply a shock to restart it, or advise that CPR should be continued. Voice and/or visual prompts will guide the rescuer through the entire process from when the device is first switched on or opened. These include positioning and attaching the pads, when to start or restart CPR and whether or not a shock is advised. 12.3 LiHT Policy decision: Schools must purchase AED devices and the number and location of these will be determined by the risk assessment. If a pupil falls ill during the school day they should immediately tell a member of staff, who will assess the situation and decide the best course of action. The pupil will be accompanied to the school office if appropriate. A First Aider will administer the appropriate response and parents/carers will be called to pick up their child if they are too unwell to complete the rest of the school day. If a child who is sent home early is still too unwell to attend school the next day, parents should contact the school on the morning of each day of absence. The school aims to reduce the risk of a spread of infection or illness and asks parents to keep their child at home where there is a risk (at least 48 hours after the last bout of sickness or diarrhoea). For prolonged absence due to illness, parents may be asked to provide the school with medical evidence such as a note from the child’s doctor, an appointment card, or a prescription paper. In the case of an accident or injury, a first aider should be informed immediately. The First Aider will assess the situation and determine whether or not emergency services need to be called. First Aiders are not paramedics, and if they feel they cannot adequately deal with the injury then they should arrange for access to appropriate medical care without delay. The First Aider will give immediate, appropriate treatment bearing in mind that a casualty may have more than one injury and that some casualties will require more urgent attention. The First Aider should arrange without delay for the casualty to be transported to a doctor, hospital or home, according to the seriousness of the condition. The First Aider’s responsibility ends when the casualty is handed to the care of the doctor, a nurse or other appropriate person, but should not leave the scene until they have reported to whoever takes charge and have ascertained whether they could be of any further help. The First Aider must complete the First Aid record form, Accident Book and Incident Record. In the case of an allergic reaction, an adult should stay with the pupil and a first aider should be informed immediately and be advised that it is an allergic reaction and the name of the pupil. The first aider will obtain the nearest Epipen kit, or the child’s own Epipen. If using the school’s Epipen the First Aider must have parental consent to do so. If in any doubt administer the Epipen and dial 999 and state ‘Anaphylaxis’. Follow the procedure for calling an ambulance set out in section 5 below. Record the details on the First Aid record form, including the details of the Epipen used (serial number, expiry date, brand etc). Keep calm and reassure the child, encourage the child to sit up and slightly forward. Remain with the child while the inhaler and spacer are brought to the. Stay calm and reassure the child. Stay with the child until they feel better. Record the details on the First Aid record form, including the details of the inhaler used (serial number, expiry date, brand etc). in the event that the First Aider does not consider they they can adequately deal with the presenting condition by the administration of first aid, or if they are unsure of the correct treatment. If an ambulance is called, the member of staff in charge should ensure that site staff are liaised with to ensure the emergency services are directed to the most appropriate entrance to the school and that access to the school site is unrestricted so that the casualty can be easily accessed by emergency services when they arrive. Pupils who are taken to hospital in an ambulance will be accompanied by a member of staff unless parents are able to reach the school site in time. Ambulances will not be delayed to wait for parents to arrive at the school. Parents will be informed immediately of any medical emergency and told which hospital to go to. Intimate care can be defined as any care which involves washing, touching or carrying out a procedure to intimate personal areas which most people usually carry out themselves but some pupils are unable to do because of their young age, physical difficulties or other special needs. Examples include care associated with continence and menstrual management as well as more ordinary tasks such as help with washing, toileting or dressing. It also includes supervision of pupils involved in intimate self-care. When undertaking intimate care two members of staff to be present and any procedure should not be carried out in an areas which is open to the school community. When two members of staff are not available, the individual member of staff should inform another appropriate adult that they are going alone to assist a pupil with intimate care. Staff should be fully aware of best practice regarding infection control, including the requirement to wear disposable gloves and aprons where appropriate. When intimate care is given the member of staff should explain fully each task that is carried out, and the reason for it. Staff should encourage children to do as much for themselves as they can; providing lots of praise and encouragement. It is good practice to ensure that the parents/cares are informed of the intimate care given on the same day. A record of the intimate care provided should be kept in situations where the intimate care was not part of an Education Health and Care Plan or a known medical condition. See appendix 4. All school visits are risk assessed and First Aid kits are available from the school office. It is the responsibility of the appointed person to ensure there is an adequate supply of all prescribed materials in the First Aid boxes and kits, and that contents are replenished after use, and not used after the expiry date. School visit leaders should inform the office staff of any items used during a school visit and must record any incident in the accident book. Refer to the Educational Visits Policy for further guidance, however care plans and related medication must be considered as part of the trip risk assessment. any member of staff who has administered First Aid must complete a form in the accident book. Records of all reportable injuries, accidents and dangerous occurrences must be kept. the accident arises out of or in connection with work. It is common practice that where a pupil sustains a head injury, which is reported to a first aider and subsequently recorded then the parent/carer should be informed in order to reduce the risk of further complication. A sample letter is attached in Appendix 5, which can be adapted for use as appropriate, however best practice would be to telephone or send a text message to ensure that the parent receives the notification. NB. Certificate must be renewed before the expiry date of the old certificate. The contents of first-aid boxes should be examined frequently and restocked as soon as possible after use. The person responsible for checking and restocking is…………………………………………………………………………………. Are there parts of your environment where different levels of risk can be identified? You will probably need to make different levels of provision in different parts of the setting. Do a large number of people use your site? What times of the day/year is your site used? Do lettings require trained first aiders? What is your record of accidents and assaults? What type are they and where did they happen? Are there employees or young people in your setting with disabilities or special health problems? Is the setting spread out? e.g. several or multi-floor buildings on the site? Is there evening, weekend or out-of –term time working? Do you have employees who travel a lot or work alone? Do you have any work experience trainees? Do you have employees with reading problems or do not speak English? You will need to make special arrangements to give them first-aid information. Don’t forget that first aiders take leave and may be absent from the setting for other reasons. You must appoint sufficient people to cover their absences to enable first-aid personnel to be available at all times people are at work. This must cover any staff who works outside term time. N.B. Before and after sessions, during holidays – because there are no pupils on site a one-day “appointed person” may be enough to cover. They were seen and monitored by one of our First Aiders after hurting their head and we have not identified anything that caused concern up to the time of them going home. If any of the symptoms listed below are present in the next 24 hours, particularly loss of consciousness (even for a short period of time), you should call an ambulance (999 or 112) or NHS Direct on 111. Extreme difficulty in staying awake, or still being sleepy several hours after the injury. It is fine to let children go to sleep after a slight bump to the head, but you should check on them regularly and make sure you are able to wake them. Having a seizure or fit. If you are concerned and would like further clarification about the incident, please speak to your child's class teacher.